At Awnings & Canopies, we are specialist outdoor engineers who have a popular reputation globally for our outdoor shading solutions. Come to us if you are looking for; retractable glass roofs, retractable roof installers, louvre pergolas, glass roofs suppliers, architectural roof systems, shop front terrace screens, glass roof installation, commercial awning installers, domestic awning installers and giant umbrellas in Birmingham. We are fortunate to have a team of highly experienced engineers here at Awnings & Canopies, who been providing good service for over 25 years in the outdoor shading industry. 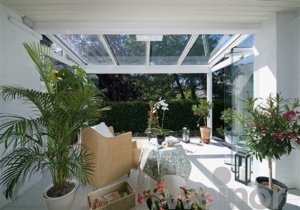 This is one of the main reasons why we strongly believe that we should be your first choice when it comes to looking for retractable glass roofs, retractable roof installers, louvre pergolas, glass roofs suppliers, architectural roof systems, shop front terrace screens, glass roof installation, commercial awning installers, domestic awning installers, giant umbrellas in Birmingham. At Awnings & Canopies, we pride ourselves in our services that we offer and for the care that we have for each of our customers in Birmingham and surrounding areas. We dedicate our time to providing great value outdoor solutions to suit both commercial and domestic clients. We are very passionate about what we do, and we feel that this shows in every service that we offer. Our prices are competitive without compromising the quality of the product and service that you receive. - Professional Team: We have a very professional team of outdoor shading installers here at Awnings & Canopies all of whom strive to achieve perfection with every single one of the services that we offer. - Highly Experienced: We have been operating as specialist outdoor shading installers in Birmingham for nearly a decade now, meaning you can rest easy with the knowledge that you are in good hands with our experienced team. - Passionate: As we have mentioned above, we are very passionate about what we do and with our services as outdoor shading installers, that we offer throughout Birmingham and the surrounding areas. - Reliable: We are here for you whenever you need help with anything. Simply give us a call or email us. - Competitive Prices: We are proud to say that we offer competitive prices on all the products that we make to deliver throughout Birmingham, such as; retractable glass roofs, retractable roof installers, louvre pergolas, glass roofs suppliers, architectural roof systems, shop front terrace screens, glass roof installation, commercial awning installers, domestic awning installers and giant umbrellas. 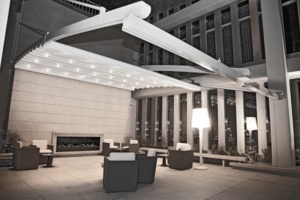 Our retractable roof system is essentially a rail roof system with retractable, 100% waterproof awnings that enable our clients to make the most of their outdoor areas and use them all year around. 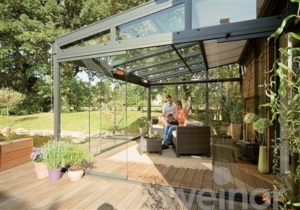 The retractable patio roof system with its clean lines and modern design, provides protection from sun, rain and wind whilst being an aesthetically pleasing asset to your property. Our retractable roof systems are typically designed for large areas and are manufactured using only the highest quality materials. We guarantee customer satisfaction and will work with you to achieve the look that you want. 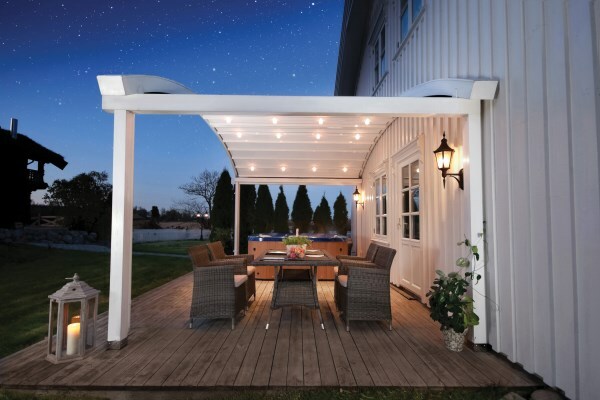 At Awnings & Canopies we only provide the highest quality products, with thanks to our connections to leading manufacturers around the globe. 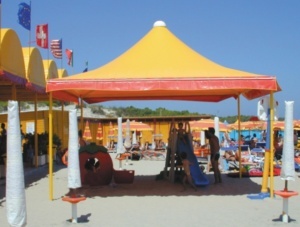 We offer a wide range of large outdoor umbrellas and giant patio umbrellas for a range of uses. We have a variety of different customizable large umbrellas to suit your taste. There are various ways you can customise your giant outdoor umbrella, from LED lighting to heating. 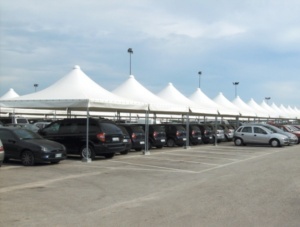 We can also print logos or branding onto the giant umbrellas. There will be no issue with weather as our range of umbrellas have been thoroughly tested and can withstand a wind force of 10. If you would like to find out more reasons to choose us for your outdoor shading solutions in and around the area of Birmingham, feel free to get in touch with our team. We will be happy to answer any questions you may have.